Musculoskeletal disorders (MSDs) are prevalent among workers in the construction industry which warrants heavy physical work, often necessitating inappropriate working postures for prolonged periods, which significantly increases morbidity and considerably decreases the work ability. The brick manufacturing industry in India, the second largest in the world following China, falls under the above-mentioned category, where the majority of the workforce is part of the unorganized sector, comprising mostly of migrant workers including men, women, and in some cases, even children. In contrast to other occupational disorders which could be attributed to occupational exposures to toxic substances, MSD among brick kiln workers owes its pathophysiology to unorthodox postures opted by these workers, where the joints and muscles are held in unconducive physiological positions for protracted periods of time, in suboptimal working conditions. The manufacture of bricks begins with mining, preparation, and molding of clay, followed by drying and burning of bricks, after which they are arranged in a prescribed fashion for transport. Prior research in this area has identified that poor working conditions, suboptimal physiological postures that compel frequent bending and twisting, and inadequate rest-breaks are among the risk factors for MSD among these workers. These musculoskeletal disorders take a toll on their lives by affecting their activities of daily living (ADL), leading to slow economic growth of their families resulting in poor overall quality of life. Brick kiln workers who comprise a part of the unorganized work sector in rural India are in a disadvantageous position and literature regarding their health problems and needs are largely unavailable. This study was done with a threefold aim of assessing the prevalence of MSD among brick kiln workers in rural Tamil Nadu, to identify common postures adopted by them during the course of their work, and to measure the intensity of pain among the workers in brick kilns. This cross-sectional study was conducted among unorganized brick kiln workers in the villages of Vellore district in Tamil Nadu. Mettuedyanpatti, Puthur, Munjurpet villages in Kaniyambadi block of Vellore district, where brick making is the prime occupation. Three hundred and ten participants who were involved in brick making for more than 1 year were included for the study after an initial verbal screening, by exhaustive sampling technique. Sample size was calculated using 1 week prevalence of low back pain 20% with 5% absolute precision. Individuals with known systemic diseases involving musculoskeletal system such as rheumatoid arthritis, Sjogren's syndrome, and cervical spondylosis were excluded from the study. An iinterviewer-administered and structured questionnaire was used which included basic anthropometric and personal data, details of the common postures adopted during work, duration of work, symptoms of musculoskeletal involvement, and the various joints affected. The questions about musculoskeletal symptoms were adopted from the modified Nordic Questionnaire. The severity and and intensity of pain was assessed by the body part discomfort scale (Jacqueline et al., 1994). A questionnaire was developed in English and then translated to the vernacular (Tamil), which was pilot-tested among a similar population. An informed written consent was taken before the verbal administration of the questionnaire. Data were analyzed using the Statistical Package of Social Sciences (SPSS Version 16.0). Descriptive data are given as mean (standard deviation [SD]), or as median (range). The association of duration of work to the severity was analyzed by univariate and multivariate logistic regression and their 95% confidence intervals (CIs) were calculated. For all tests, a two-sided P value of 0.05 or less was considered statistically significant. This study was approved by the Institutional Research Board of Christian Medical College, Vellore and the confidentiality of the participants during the study and the analytical phase was maintained using unique identifiers. The brick kiln workers recruited for this study were from the villages of Munjurpet (61%), Puttur (37%), and Mettuediampatty (2%). There was a male predominance (55%). The mean age was 37 ± 13.2 years with a range of 18-85 years. Majority of the workers 62% (n = 192) had a normal body mass index (BMI), whereas 27% (n = 85) were found to be undernourished with a BMI of < 18. Most of the women were in the reproductive age group, with only 23% (32/139) being post-menopausal as shown in [Table 1]. A total of 64% (64%) of the workers had been in the brick manufacturing occupation for more than 10 years. 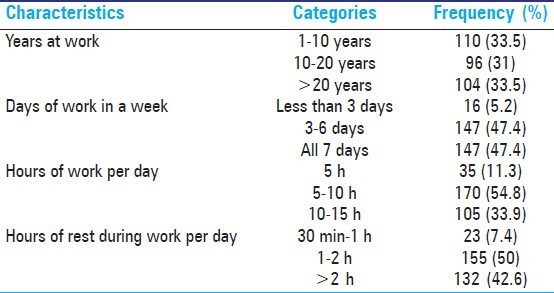 Approximately half of them (47.4%) worked for 6-7 days per week, and another 47.4% worked between 3 and 5 days per week as shown in [Table 2]. About one third of the workers worked overtime for >10 h per day. The common postures adopted during majority of the working time were squatting (67%), stooping (19%), and standing (14%). History of trauma that could have contributed to the MSD was elicited in a minority (14%) of the workers. Majority of the study subjects (87%) experienced some kind of pain, with more than half of them (51%) having pain during work. A total of 65% of them had either moderate or severe form of pain when assessed with the body pain discomfort scale. During last 12 months, 59% (n = 183) of the workers had low back pain and 45% (n = 139) had knee pain. The sites, frequency, and distribution of chronic pain are shown in [Table 3]. ADL were affected in 13% of those with low back pain and in 10% of those with knee pain. Workers employed for more than 10 years had a higher incidence of chronic back pain (66.55% vs. 45.5%; P =< 0.05) and chronic knee pain (56% vs. 24.5%; P =< 0.05) when compared to those employed for less than 10 years and these differences were statistically significant with P < 0.05 and higher odd's ratio as shown in [Table 4]. These workers also had significantly higher odds of suffering from acute (1 week) low back pain [odds ratio (OR): 2.28 (95% CI 1.27-4.09), P < 0.05)] and acute knee pain [OR: 3.26 (95% CI 1.57-6.71), P < 0.05]. Workers employed for more than 10 years had 3.11 times higher odds of suffering from either moderate or severe form of musculoskeletal pain (95% CI 1.78-5.66; P =< 0.05). Approximately, one fourth of them use some form of topical analgesics (24.2%) as self-medication for pain relief, while another quarter of them preferred only rest for pain relief. Nearly, 30% use various forms of oral or injectable analgesics available over pharmacy counters. Those who had severe or moderate form of pain had lower mean score (7.57, SD −2.28) in the visual analogue scale on job satisfaction (P <0.05, t statistic 2.476) than those with mild pain (6.80, SD −2.22). As per the Economic Survey 2007-08 out of 440 million workers in India, 93% of the workers are in the unorganized sector. The contributions made by the unorganized sector to the national income are very substantial as compared with that of the organized sector. A subcommittee of the National Commission for Enterprises in the Unorganized Sector in 2012 estimated that the contribution of unorganized sector to Gross Domestic Product is about 53.9%. Brick kiln industry is one such sector where the workers are prone for a variety of MSD due to the stressful work posturing and heavy unregulated work load. This is further compounded by physical discomforts at the work place and poor access to health care. Workers earn money depending on how many bricks they make and not how many hours they work. As the workers adopt a constant posture for many hours at a stretch, they are at risk for developing severe musculoskeletal pain which invariably reduces work efficiency and output. Work-related MSD includes inflammatory and degenerative processes that may involve the muscles, tendons, cartilages and joints, causing pain and functional impairment. Though our study had male predominance, the high also involved in brick making industry, signifying the way of living in the rural setting. Moreover, the unorganized brick kiln industry is a cottage industry in rural areas, where the entire family is involved to sustain their livelihood. In our study, majority of women (70%) reported some kind of pain. As most of these women (67%) were in the reproductive age group and going through physiological events such as menstruation, child birth, they were more vulnerable to pain than men. This may be possible confounders which are challenging to measure. A significant proportion of our workers (27%, n = 72) were malnourished which reflects their poverty and low economic status. As more than 75% (n = 55) of the malnourished workers experience either moderate or severe form of pain, their productivity at work is likely to be affected. Even though the majority of the workers in our study were employed for more than 10 years, they have no coverage of social security and have to spend out of their meager incomes for all contingencies such as illnesses and children's education. In their old age they are helpless and none of the provisions under the Unorganized Workers' Social Security Act of 2008 are implemented at their work place. The Act has provisions for life and disability cover, health and maternity benefits, old age protection, and recommends suitable welfare schemes such as provident fund, employment injury benefit, and housing, and so on for unorganized workers. Though regulations on maximum working hours and entitled leave do exist, workers in our study were made to work overtime due to the continuous demand to meet the target number of bricks for the week or month. Neck and upper limb pain were reported in a significant number of brick workers in some studies. ,, We found only a minority of our workers suffering from neck (11.3%, 35/310) and upper limb pain, while the knee joint was the second most affected joint. This could be attributed to the commonly adopted postures in our study population, which is squatting, followed by standing for moulding and clay making. Clay making and moulding work is an important activity, which decides the quality and finish of bricks, which requires hard and long hours of work in similar positions and postures. These postures can affect soft tissues such as muscles, ligaments, and spinal discs. Squatting exerts great pressure on different body parts such as the leg, knee, thigh, back, spinal cord, and on the shoulder and feet as well. This posture can lead to contact stress on the popliteal fold (back of the knees) and pooling of blood in the feet. They can also cause fatigue and discomfort, placing the worker at risk of developing a work related MSD. Many of the studies conducted in various industries where manual labourers are involved in strenuous work have shown positive correlations between MSD and common postures adopted at work. In a study done at a fish processing industry in Ghana, where workers were involved in heavy manual handling, trunk flexion and/or twisting, pushing, pulling, and lifting weights from below the ground level, neck and upper limb problems were found to be predominant. Similarly, an Indian study among forging workers showed that operators working in an inadequate working environment with awkward postures, have a high risk of development of musculoskeletal disorders. Our study also reveals that most of the workers experience pain during work (51%, 158/310), which may cause discomfort, fatigue, and eventually lead to lesser production and earning. Those who experience severe or moderate form (64.8%, 201/310) of pain also seem to be less satisfied with their work, and this may have psychological impact on the quality of life. A study which examined changes in general health and time with back and neck pain, identified predictors of any such changes. The study showed that there was a significant decline in general health and significant increase in time with neck pain and back pain. They concluded the predictors of changes in these outcomes were mainly work-related variables such as job interference with family, work-related psychological demands, job influence, and hours worked. Heuer et al.,  found that musculoskeletal complaints among bricklayers decreased with the length of employment. Further investigation revealed this was most likely due to a ''healthy worker effect'' where individuals' susceptible to musculoskeletal complaints leave the trade, leaving their more resilient colleagues in the workforce. This is an important phenomenon to be considered while attempting to assess morbidity among the workers in the unorganized sector. Our study is a community-based study with adequate sample size and used validated tools to measure MSD. However, the limitations are the lack of postural analysis and non-assessment of some of the confounders such as domestic activities. This study shows that awkward postures adopted by brick kiln workers during work are directly related to their MSD, which also affect their ADL. Prolonged years at service and overwork also have significant impact on the prevalence of MSD. This study recommends detailed research, health education to the workers, implementation and monitoring of laws in unorganized sectors to tackle morbidity related to MSDs. Mr. Sam, Occupational Therapist, Christian Medical College, Vellore, India. Dr. Nishanth Arulappan. Medical Officer, Lady Wellington Hospital, Manali, India. 1. Kukum P, Aditi V. Work related musculoskeletal disorders of workers in brick making factories in Uttarpradesh - An ergonomic approach. Int J Adv Engineer Technol 2012;3:121-5. 2. Available from: http://www.demotix.com/news/242762/migrant-labour-workers-brick-kiln-india [Last accessed on 2010 Aug]. 3. Basra G, Crawford JO. Assessing work related upper limb disorders in a brick making industry. In: Robertson SA. (Ed), Contemporary Ergonomics 1995. Taylor and Francis, London, p. 480-485. 4. Kilbom S, Armstrong T, Buckle P, Fine L, Hagberg M, Haring-Sweeney M, et al. Musculoskeletal disorders: Work-related risk factors and prevention. Int J Occup Environ Health 1996;2:239-46. 5. Mufamadi NE. The study of work-related musculoskeletal disorders amongst workers in brick making factory in South Africa 2003: Master′s thesis for Msc. Engineering. Lulea University of Technology, Sweden. Available from http://epubl.ltu.se/1402-1617/2003/090/LTU-EX-03090-SE.pdf [Last accessed on 2013 Sep]. 6. Kuorinka I, Jonsson B, Kilbom A, Vinterberg H, Biering-Sørensen F, Andersson G, et al. Standardised Nordic questionnaire for the analysis of musculoskeletal symptoms. Appl Ergon 1987;18:233-7. 7. Available from: http://www.indiabudget.nic.in/es2007-08/industry.htm [Last accessed on 2013 June 3]. 8. Labour Laws and other Labour Regulations.Planning Commission of India .Available from: http://planningcommission.nic.in/aboutus/committee/wrkgrp11/wg11_rplabr.pdf [Last accessed on 2013 Sep]. 10. The unorganized worker′s Social security Act, 2008. Gazette of India, Ministry of Law and Justice. Available from: http://www.ilo.org/dyn/travail/docs/686/Unorganised%20Workers%20Social%20Security%20Act%202008.pdf [Last accessed on 2013 sep]. 11. Kilbom A, Armstrong TJ, Buckle P, Fine LJ, Hagberg M, Haring-Sweeney M, et al. Musculoskeletal disorders: Work-related risk factors and prevention. Int J Occup Env Health 1996;2:239-46. 12. Riihimaki H. Low back pain, its origin and risk indicators. Scand J Work Environ Health 1991;17:81-90. 13. Hagberg M. Exposure variables in ergonomic epidemiology. Am J Ind Med 1992;21:91-100. 14. Chung MK, Kee D. Evaluation of lifting tasks frequently performed during fire brick manufacturing processes using NIOSH lifting equations. Int J Ind Ergon 2000;25:423-33. 15. Ray Chaudhuri S, Biswas C, Roy K. A subjective and objective analysis of pain in female brick kiln workers of West Bengal, India. Int J Occup Saf Health 2012;2:38-43. 16. Manoharan PK, Singh BK, Jha SK. Ergonomics investigation using psycho-physiological study for brick kilns′ in Jharkhand. Int J Environ Sci 2012;3:1484-91. 17. Imaekhai L. Musculoskeletal problems among brick packers: A Nigeria perspective. Adv Life Sci Technol 2012;4:17-8. 18. Kumar S. Theories of musculoskeletal injury causation. Ergonomics 2001;44:17-47. 19. Quansah R. Harmful postures and musculoskeletal symptoms among sanitation workersof a fish processing factory in Ghana: A preliminary investigation. Int J Occup Saf Ergon 2005;2:171-80. 20. Singh J, Lal H, Kocher G. Musculoskeletal disorder risk assessment in small scale forging industry by using RULA method. Int J Engineering Adv Technol 2012;5:514-8. 21. Shannon HS, Robson LS, Sale JE. Creating safer and healthier workplaces: Role of organizational factors and job characteristics. Am J Ind Med 2001;4;319-34. 22. Heuer H, Klimmer F, Kylian H, Seeber A, Schmidt KH, Hoffmann G, et al. Musculoskeletal problems in bricklayers as a function of length of employment: The role of secondary selection by low back pain. Work Stress 1996;10:322-35.